When you decide that Fountaingate Gardens will be your new home, you will have the choice of many different floor plans that will enable you to create a unique living space. 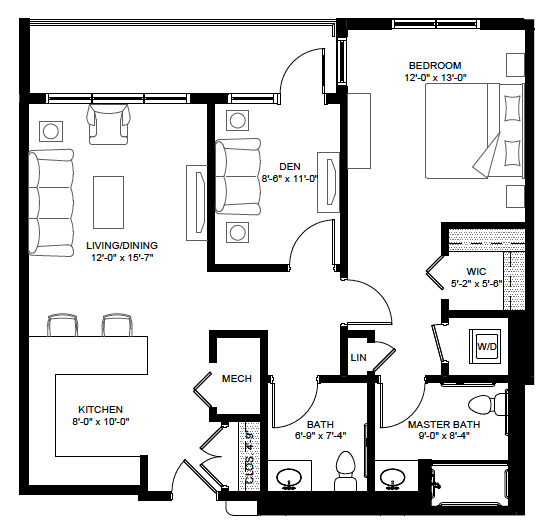 The Rose, a one bedroom with den apartment home is perhaps our most versatile floor plan. With ample space and all the desired features of a modern, comfortable residence, the Rose will blossom into a home that is just right for you. The Rose features a modern kitchen outfitted with the latest appliances, and a peninsula for additional seating. The open concept layout allows for a seamless transition between cooking and hosting – or preparing a snack while watching TV or conversing. The shared living room and dining area is spacious enough to feel comfortable when having a quiet night in or when hosting a dinner party. The adjacent den is a flexible space you can customize into the perfect spot to watch TV, work, read or pursue your favorite hobbies. With the large windows in the den, living room and bedroom, and the attached patio or balcony, natural light can greet you throughout your day. The bedroom in the Rose apartment home has a cozy atmosphere and a generously sized walk-in closet to organize your belongings. The full bathroom is conveniently located adjacent to the bedroom . Functionality and flexibility, paired with an open concept, make this apartment home a sought-after floor plan. With the added convenience that comes with the numerous services and amenities provided by Fountaingate Gardens, it’s no wonder that the Rose is a staff favorite. To learn more about the Rose floor plan or one of our many other designs, call us today at 631-210-5806. FAQ: Will My Pets be Welcome at Fountaingate Gardens?